At Christmas in 1901, when he was 13 years old, my second-great grandfather Ernest Benedick received a photo album that grew to include cabinet card photographs of a handful of relatives. When I inherited the album from my grandmother, I was disappointed to find that many of the photos were unlabeled. There were only a few that had inscriptions, including one that included more than just a name. A handwritten note identified the man as Volney Finch. At first, I didn't recognize the surname nor understand how he fit into my family tree, if at all (perhaps he was just the neighbor). 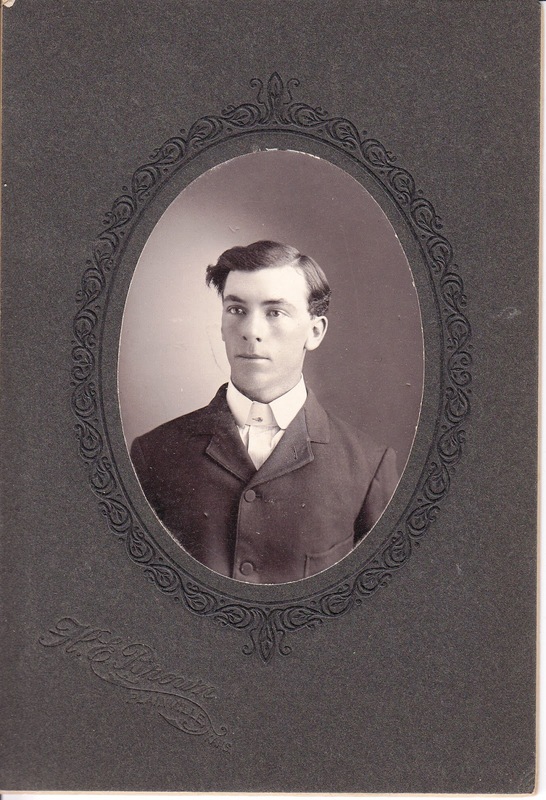 The note also indicated the portrait was taken on April 11, 1904. It seemed unusual to flag the date the photograph was taken (considering most of the images went without any written caption at all). 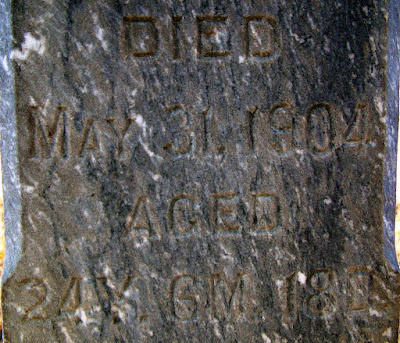 With no further explanation, the scribe also noted that Volney died May 30, 1904.
Who was Volney - a seemingly young and healthy man - and what happened that he passed away less than two months after sitting for his photograph? Swiftly climbing through the family tree, I learned that Volney wasn't a blood relative but fit into my pedigree through marriage. His brother Richard married a woman named Christina Bair. Christina was a sister to my second great-grandmother Bessie Bair. Bessie married Ernest Benedick, the original owner of the photo album. That makes Volney Finch the brother-in-law of my third great-aunt. Did you follow all of that? A name search of the Plainville Gazette, the local Kansas newspaper where Ernest Benedick lived returned a few results. On June 2, 1904, the paper published a brief notice that Volney had been brought to Plainville a few weeks prior for treatment, but died on May 31, 1904 (differing from the death date inscribed on the back of the photo). Unfortunately, the blurb didn't detail the cause or reason for Volney's treatment. Was it an accident or illness? 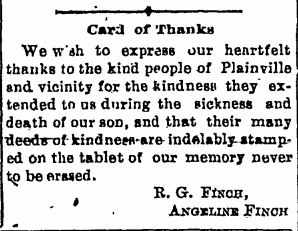 In the following week's edition of the Plainville Gazette, Volney's parents Richard and Angeline Finch published a card of thanks. The note from Volney's parents thanked their neighbors "for the kindness they extended to us during the sickness and death of our son..." So Volney had been sick. 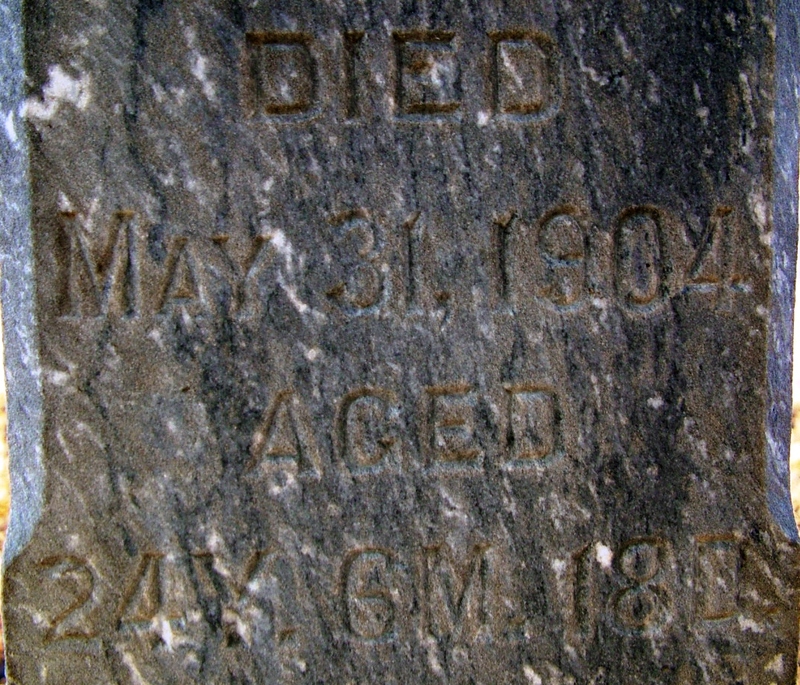 His age was chiseled into his obelisk stone memorial: 24 years, 6 months, and 18 days old. 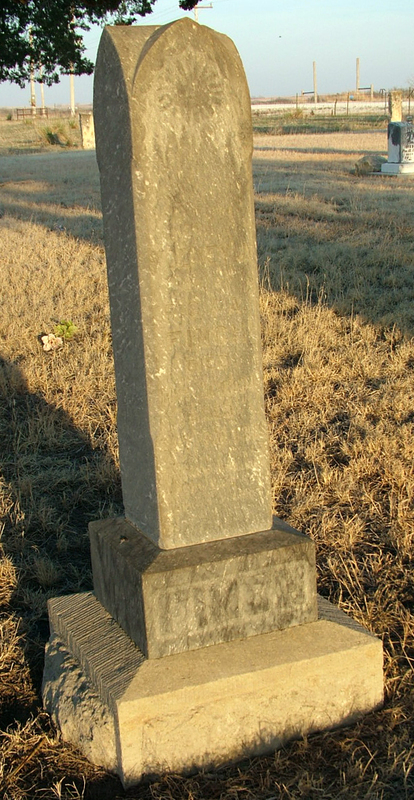 Volney Finch headstone, photo used by permission of FindAGrave user Suz. What was the illness that took his life so prematurely? Unfortunately, Kansas didn't begin keeping death records until 1911; Volney's passing pre-dated any official record for cause of death. However, a third newspaper notice may hint at a clue. 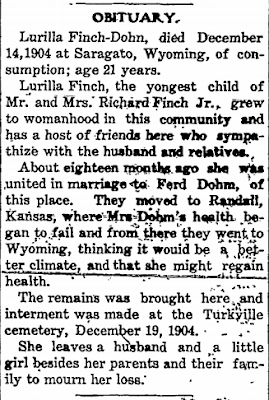 On December 22, 1904, the Plainville Times, published the obituary for Volney's younger sister Lurilla. Lurilla passed away - later the same year as her brother Volney - at the age of 21. According to her obituary, she succumbed to consumption (likely tuberculosis). Tuberculosis is a highly contagious disease. Did Volney suffer from tuberculosis? 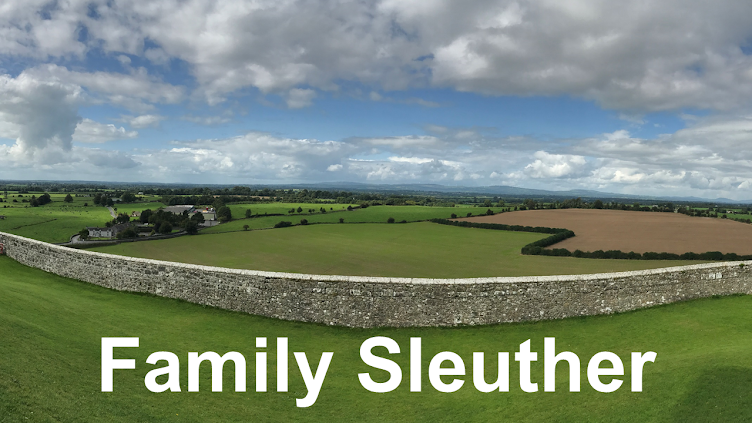 Given the contagious nature of the disease and the timing of the two siblings' deaths and likely proximity to each other, it seems quite possible that he also succumbed to the affliction. Whatever the cause of his death, Volney is now remembered and not lost to history. Fellow genealogy blogger Janice Webster Brown found mention of Volney Finch's passing in the Stockton Review and Rooks County Record. This blurb sheds more light on the nature of Volney's affliction with the note that he was receiving "medical treatment for stomach trouble." There's no mention of lungs or respiratory issues, which I would expect if he was suffering TB. Does this suggest he suffered from an altogether different affliction? It would seem so. Many thanks to Janice for her kind help in telling Volney's story. Great post. And interesting research results. Thank you, Nancy. I appreciate the kind words. I like the way you too a scrap of information and turned it into a whole story. I think you've made a good guess. He even looks consumptive in that photo. Even though he's not my blood kin, I've had a fondness for him, this photograph, and his sad story since I first saw the image. Volney's story is the story of disease in America and how folks succumbed before the discovery of antibiotics to now treatable ailments. TB was so prevalent then and so deadly that I bet you are right. I've found so many deaths of young people caused by TB. It always makes me grateful for modern medicine. Great post! Certainly our ancestors - if they didn't marry and share deep love - at least had hearty genes and constitutions to survive the many ailments that had no treatment. I enjoyed your story. It sounds very plausible to me. There is something about a picture of someone who looks so young and healthy and how it contrasts to what actually was going on in his life. You can never judge a book by its cover. You never can judge a book by a cover, or if you do you risk getting it royally wrong. Thank you for sharing, Joe's story. I appreciate it. That's the whole point...We Speak their Names and keep their Memories and Lives, Alive. Sweet Post. Wonderful piece, I always enjoy reading your post. Thank you! Thank you, Joyceann. I appreciate that, and I'm very glad to have you along for the ride.